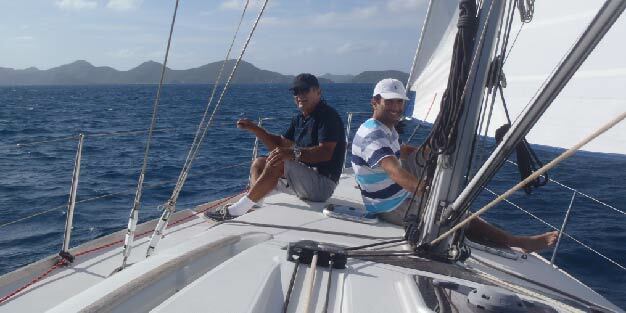 I had just become a certified coach and a certified sailor that same year, and I thought to myself, what better way to celebrate these accomplishments than taking my dad, brother, and nephew on a sailing trip around the British Virgin Islands… and of course, practice my newly acquired coaching skills with them! I know what you are thinking, this is just like giving a sixteen-year-old a driver’s license and expecting them to drive for the first time in Los Angeles during rush hour. Nonetheless we set sail! It was not long before my brother made it very clear that he was not interested in coaching, specially when we were that close to reaching our destination and the pressure was building amongst the inexperienced crew we had (including myself). “Does the main sail look ok?” he asked with some hesitation. The coach in me quickly kicked into action, “What do you think? How can we make it better?”. I could see it in his eyes, my answer was not satisfactory – “Do you want me to crank this thing some more or not?” he replied. As far as I was concerned, the coaching session had begun – “It is called a winch! And what do YOU think would happen if we did or didn’t turn it?”. Yup, you guessed it, he lost it – “Listen, I am not interested in being coached, I am hungry and just want to dock safely, so just answer the question. Do you want me to turn it or not?” Of course, those were not the exact words he used but you get the point. My answer… a simple “Yes please”. It was an amazing experience where we were able to work as a team, spend time together, and enjoy a beautiful sailing trip! That was many years ago and sailing has become one of my passions. There is so much to learn from this sport that can be applied to life. Take control of your career and your life by dedicating the necessary time and effort to plot a course for success. Hoping that things turn out ok or will work out at the end is the equivalent of being adrift at sea, where your sailboat is at the mercy of the current and the waves. Be intentional about your strategy and your plans to ensure that you are moving in the right direction. Course correcting is a lot easier than realizing you are way off your destination. Take some risks! Get out of your comfort zone and into the learning zone. Growth is all about stretch goals, exploring the unknown, meeting new people, and being more adventurous. It is about calculating the risks to be taken vs. the rewards to be enjoyed. Remember, if you never leave the dock, you will never reach amazing destinations. Learn to adapt! We are constantly dealing with change and that is not going to be different any time soon. You don’t have to like change, but you do need to learn how to maneuver uncomfortable situations in order to move forward and make the best of it. You may not always get what you want, but you can definitely adjust your attitude, strategy, and plans to accommodate unexpected life turns. Be ready to seize the opportunity! A promotion milestone was reached, an important client acquired, a challenging project assigned, or a new relationship developed. When events are in your favor make sure to take advantage of the momentum and reach for new heights. Create awareness of the behaviors, skills, and relationships that made this possible and leverage them in the future.